Martin Duberman’s 1974 book ‘Black Mountain College’ was the first in-depth exploration of community during the college’s 24-year lifespan, followed in 1988 by Mary Emma Harris’s “The Arts at Black Mountain College”. What both of these enlightening and entertaining works made clear was that community at Black Mountain was a fluid, ever-changing entity, subject to highs and lows, periods of calm and disruption, growth and decline. 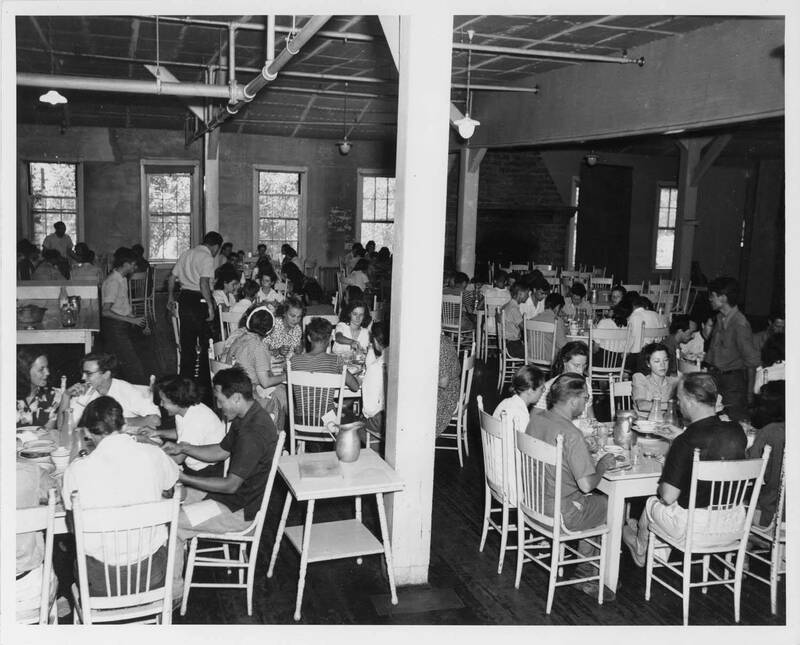 Although the college is sometimes compared to nineteenth and twentieth century artists’ colonies or intentional bohemian communes, Black Mountain fundamentally differed from these kinds of groups because it was an educational institution first and foremost. But it did share some important characteristics: its democratic structure and communal work program resembled that of communes like Brook Farm or New Harmony, and the mountain resort setting and emphasis on the arts resembled many artists’ colonies, both in Europe and America. Black Mountain also shared some of the same problems: interpersonal disputes, staying financially viable, and enduring for a long period of time. From its founding, the college fostered a democratic sense of community that put students and faculty on equal terms, which led to on-going, honest discussion and collaboration. Sometimes this democratic process became problematic, such as in the case with faculty meetings, which always included three or four student representatives. Unanimous consent was required to make any official decision, therefore discussions could go on and on. Despite the occasional arduousness of this process, the clear benefit of the democratic system was that it allowed for open discourse, which promoted closer relationships between faculty and students, as well as visitors, and led to numerous examples of collaboration and friendships that lasted long after the college dissolved. 1. ‘Group process’ was used by writer Louis Adamic in his 1936 article in Harper’s, ‘Education on a Mountain’; ‘sense of community’ is a term coined by sociologists David MacMillan and D.M. Chavis in 1976; ‘creative sociability’ is derived from historian Nina Lübbren’s study of nineteenth century artists’ colonies. 2. Bill Levi, ‘The Meaning of Black Mountain,’ Address given at Black Mountain College, Fall 1947, reprinted in Black Mountain College, Sprouted Seeds: An Anthology of Personal Accounts edited by Mervin Lane (Knoxville: University of Tennessee, 1990): 183. 3. Ted Dreier, ‘Early Close Calls,’ in Lane, ed., Sprouted Seeds, 27. 4. Rice quoted in Katherine C. Reynolds, ‘Progressive Ideals and Experimental Higher Education: The Example of John Dewey and Black Mountain College,’ in Education and Culture, 14:1, Spring 1997, 4. 5. John Andrew Rice, I Came Out of the Eighteenth Century (New York, London: Harpers, 1942) 325.